Scientific Name(s): Rosa canina L.
The direct translation from Latin of Rosa canina to English yields the common name of dog rose. Its ethnobotanical use dates back at least two millennia, and emphasizes the lasting role of roses in many cultures. Dog rose grows in open woodland, in open scrub, along hedgerows or along waysides across Eurasia and northern Africa. 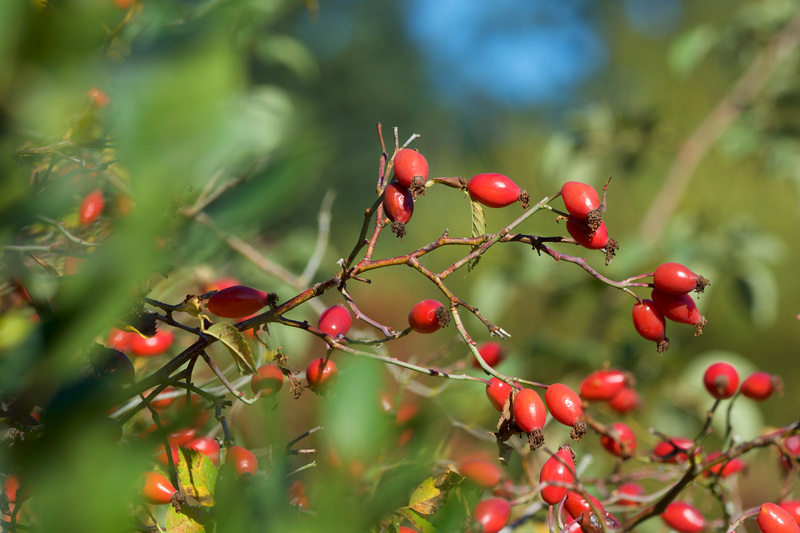 The bright red rose hips ripen in late summer and autumn, providing lively color as the leaves begin to dessicate. Plants can grow to approx. 3m (10 ft.) in height, but can reach higher into trees enough support. The species is cultivated throughout and beyond its range thanks to its rich collection of medicinal and edible uses. This passage from Strabo’s ninth century Hortulus further emphasizes the inherent cultural importance of roses. While he’s referring to roses in general, the deep-rooted history of Rosa canina leads me to believe he had it in mind when he wrote the short piece. The medicinal value of Rosa canina dates back at least to the writings of Pliny the Elder (23-79 AD), whose notes about roses are often quoted. The petals, rose hips, and roots have been used for various remedies, astringents, and skin lotions as well as ingested as sources of antioxidants and vitamin C. Indeed, rose hips have a proportionately higher vitamin C content than many common fruits or vegetables, sometimes at concentrations of 300-400mg per 100g (in the linked study, vitamin C in the skin of the rosehip was measured at 230mg per 100g, but concentration in plants varies due to many factors). Parts of the plant have also been widely used to make herbal teas or jam. 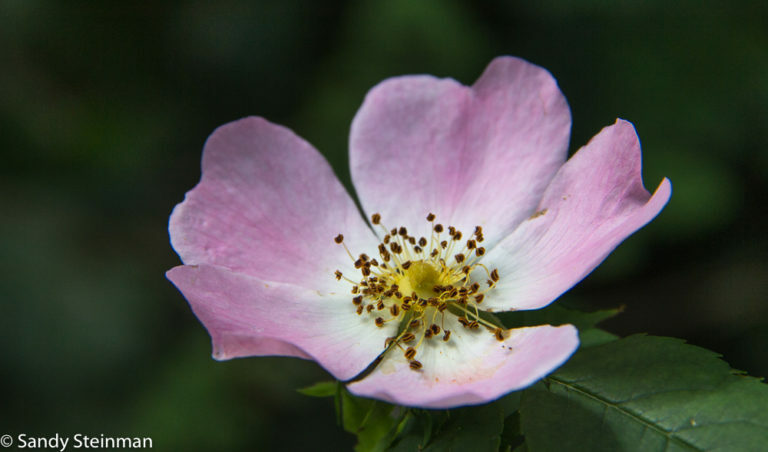 In her book on traditional herbal remedies, Svetlana Konnikova shares some interesting folklore on the history of Rosa canina in Europe. According to her, there was a time three centuries ago in Russia when rose hips were valued higher than gold for their medicinal properties! The rose hips could only be acquired by exchanging valuable goods. Apparently, they were held in the pharmaceutical stock of the Kremlin, and permission from none other than the Russian tsar was needed to gain access to this “miraculous healer”. It appears that there are three possible origins for the common name of the dog rose. Most online sources seem to agree that it was used in the past to treat bites from rabid dogs. Some sites claim it was used in recent centuries as a treatment, while others date its use back to the Romans or Greeks. One site asserts it was Pliny the Elder’s idea to use the roots as a cure for dog bites. The derogative meaning of the word “dog”, alluding to the supposedly worthless ornamental use of Rosa canina in comparison to other garden roses, is generally believed to be an incorrect understanding of the common name. A third idea sometimes encountered is that the name is derived from the word “dag”, meaning “dagger” in Old World English, referring to the rose’s prickles. Dog rose is an aggressive weed in the vicinity of Hell’s Canyon in Oregon and Idaho. Only in hell would a rose be considered a weed! Teaching biology students our native plants in the Dutch dunes, for R. canina referring to the shape of its prickles, we used the mnemonic: the dog rose bears cat claws. is it true that canina does not sucker? trying to identify a locally found species rose NOT multiflora! Chris, there are so many native roses, some that sucker, some that don’t. Depending on where you live, you could plant a truly local species – check the web for roses native to your area. Rosa canina is beautiful, and Rosa multiflora is a serious invasive. But please do not plant an aggressive non-native (which R. canina IS in some areas) just because it is not as bad as another. I love this one! I grows wild all over my part of Sweden and in my garden too. I have a big one climbing in my Lilac hedge – it’ s so beautiful in the summer and winter. I don’t see it as a weed for sure! It looks like a wild cousin of my favorite rose, “Dainty Bess.” (I don’t know how accurate the color is on these photos–probably quite good.) Bess is pale pink with maroon stamens. The scent is heavenly – perhaps the Dog Star has something to do with it. I remember being given rose hip syrup as a child to boost our Vitamin C intake. We used to collect the hips from the hedgerows and mum boiled them up with some sugar to make a cordial, very delicious it was too.